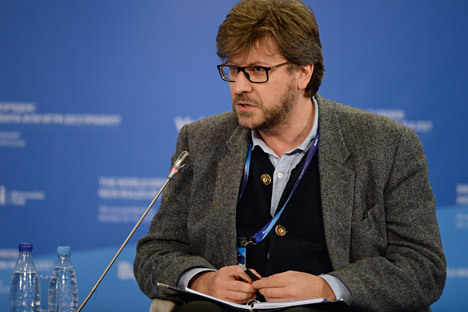 Fyodor Lukyanov, editor in chief of the Russia in Global Affairs journal, at the 11th meeting of the Valdai International Discussion Club in Sochi. Jakarta plays host to a meeting of the Valdai Club, one of Russia's most respected intellectual platforms, on November 26 and 27. Fyodor Lukyanov, scientific director of the club, spoke to Rossiyskaya Gazeta about the agenda of the meeting, in an exclusive interview. RG: This is not the first time the Club is meeting outside Russia. Meetings have been held in Berlin, Singapore and London. Why was Jakarta chosen to host the forum this time? Fyodor Lukyanov: Indonesia is among the world’s most ambitious and rapidly developing countries. It is also very large, with a population of around 240 million. There is great potential. At one time, under the previous authoritarian regime, Indonesia was one of the Asian Tigers, and now, under the current President Joko Widodo, it has great aspirations. Secondly, Indonesia is the most populous member of ASEAN. ASEAN is one of the world's most successfully developing regional associations. It has its own special model of integration. The ASEAN countries are developing very rapidly with harmonization of their economic relations. (The Jakarta Forum meeting comes close on the heels of the recently concluded ASEAN summit, held at Kuala Lumpur, capital of Malaysia, the only other Islamic majority state in ASEAN. ASEAN heads of government also met leaders from India, China and Japan in the ASEAN plus summits: Editor’s note). With specific regard to Indonesia, its importance has increased in the context of the Trans-Pacific Partnership Agreement. Currently, universal rules of international economic relations are gradually being substituted with new regional ones. These rules are being written by a closed circle of countries. Indonesia has stated that it will enter into the circle of these countries. Therefore, it is important for us to hold a meeting of our club in a part of the world where a new system is being formed, and in a country which will play a significant role in this new system. RG: On what is the meeting focusing? Asia is changing radically. It is turning into a consuming region from a producing region. That's why the answer to the question of what Asia wants is so important. That is, what it wants to consume not only in terms of food and clothing, but on the whole. We are looking at Asian aspirations as it moves from a lower income region to a middle income one. It concerns not only an economic model, but also political ambitions. The Asian region is becoming the place of, perhaps, the most important global processes. So far, all the world's attention is focused on the Middle East, and it is clear why; there is war, bloodshed, extremism, and cruise missiles. But if we step aside and distance ourselves from the immediate emotions that overwhelm us, it must be admitted that the fate of the world is being decided in Asia today. It is not a coincidence that the United States ‘crawls away,’ if I may say so, from the Middle East right now and becomes more focused on Asia and the Asia-Pacific region, including through new economic mega blocs. In this situation, Asia, of course, feels its potential role, but does not yet quite understand how to behave. So, our objective at this forum is twofold. First, to understand what Asia wants and, on realizing this, there is the second goal; to reflect on what Russia might undertake concerning Asia. RG: To what extent has the agenda of the Indonesian Valdai been affected by the recent terrorist attacks in different parts of the world? F.L. : I would venture to say that agenda is almost not affected. Of course, Indonesia is also facing the threat of terrorism. This is a Muslim-majority country, and it is afraid of the ideology of radical Islam sneaking its way in. But the Asia-Pacific is a booming region, unlike the Arab East. People have something to lose here. Instability will destroy a lot of things. No one, however, is immune to Islamism.